CD review: "Central Avenue Sounds: Jazz in Los Angeles (1921-1956)"
Set fails to make case for L.A. This review first appeared on SignOn San Diego on December 14, 1999. Most box sets are built around a theme: the collected works of an artist, or the best works from a particular label. Few are built around an argument, though. This isn't the West Coast school they're talking of, or even the "cool" movement that countered bop. Rather, from reading the liner notes, it's the contributions across a variety of styles made by individual musicians in Los Angeles, primarily in the black community along Central Avenue. It's a rather unusual basis for developing a collection of music  and one that ultimately fails to convince. As the producers acknowledge in the liner notes, L.A. didn't produce a regional style of jazz the way New Orleans, Kansas City or Chicago did at different points. And it was never the mecca for young jazz lions the way New York was. Still, the impressive quality of the music presented here makes up for any conceptual shortcomings in the overall project. The recordings range from the early New Orleans sounds of Kid Ory (one of the very first jazz musicians to relocate to Los Angeles early last century) through Nat "King" Cole's ever-so-smooth vocals and the Texas blues of T-Bone Walker, from Charlie Parker's early bop to the equally driving sounds of Dexter Gordon and Wardell Gray, and giants like Charles Mingus, Lester Young and Charles Brown. But perhaps more representative of Los Angeles would be those who made their careers in the city, rather than relocating here after they were established: musicians such as Buddy Collette, Benny Carter and Gerald Wilson, all to be found here alongside tracks from the above. 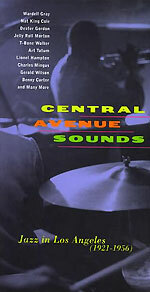 As mentioned, though, despite the impressive roster of names, "Central Avenue Sounds" fails to make a convincing argument for L.A.'s importance in the development of jazz during the music's commercial glory years. Most of the big names on this collection were from elsewhere and made their stamp on the music somewhere other than Los Angeles, even if they recorded in L.A. or lived there briefly. Instead of the breeding ground of musical geniuses the liner notes portray, the picture that emerges from the music itself is of a city that offered plentiful opportunities for musicians to find work, but that did not identifiably shape their music the way a Kansas City did to New Jersey's Count Basie, or Chicago the sounds of Iowa's Bix Beiderbecke. L.A. has certainly generated some talented musicians in its time, musicians who contributed mightily to jazz. But to try to put L.A. in the same league as the above jazz incubators is much too far a leap, even given the incredible music found on this collection.